Some of our customers recently complaining about this error message during ToolBox Installation using 2007 R1 Installer which released on last 31 January 2007. 1. ToolBox out of sync. To manage the user controls in the Toolbox, Visual Studio maintains a list in the Registry. 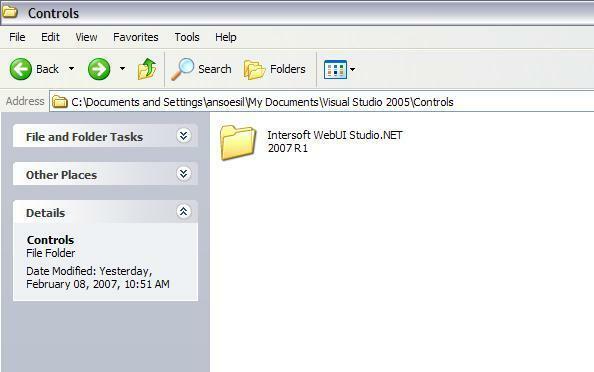 This list refers to directories under the <My Documents>Visual Studio 2005Controls folder. This list must contain existing directories. If this list contains entries for directories that do not exist, the Toolbox package fails. 2. Corrupted registration entries that manage the packages. Currently we have implemented a new way to install the controls to toolbox, so you can have faster and smoother installation process. This new technique no longer depends on “devenv /setup” or “InstallCommunityControls”, so rest assured that these existing problems have been completely eliminated. We will post this new installer in near future. I tried lot of methods to install custom server controls to Visual Studio toolbox. Some methods install controls to toolbox. But after uninstalling them, those controls still display in the toolbox. Please let us know your new method.